Cooking a new cuisine can seem daunting—from deciphering foreign-language labels to trying out a new recipe. To help demystify the great ingredients on our shelves, we’re starting a series of events called Providore Pantry. With a little knowledge and just a little practice, these one-of-a-kind foods are sure to become new staples in your home cooking! Many customers rely on our store for specialty European groceries, but did you know we also stock some of the finest Japanese ingredients on this side of the Pacific? That’s why we’re kicking off our Providore Pantry series with help from Lola Milholland, maker of fantastic local ramen noodles at Umi Organic. Join us for a very special hands-on class, where Lola will cook some of her delicious noodles and share her tips for making your own weeknight ramen. 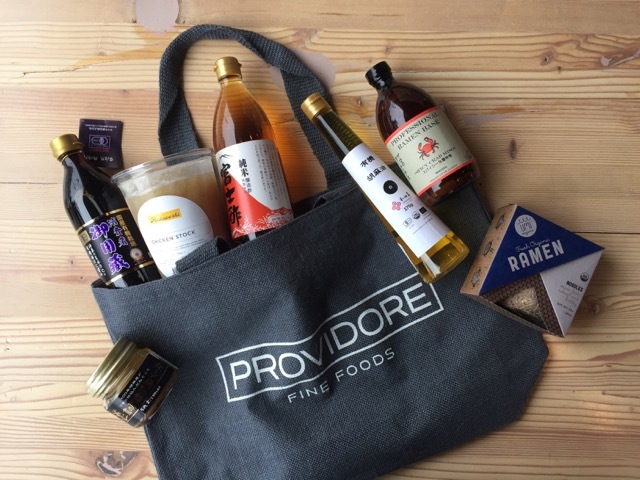 The team at Providore will then open up bottles of our favorite Japanese shoyu, vinegar, ramen stock, sesame paste, and more for you to taste and explore as you BYOB—build-your-own-bowl of ramen to enjoy. Tickets: $25, Includes a hands-on class & tasting, a bowl of ramen, and a 10% discount on featured products that evening.